Warm, cheesy potato casseroles come in several incarnations -- cheesy potatoes, which are baked with sour cream and condensed soup; scalloped potatoes, which have a white sauce base; and potato gratins, which are nothing more than potatoes, cream and grated cheese. Because potato gratins have so few ingredients, it's important to use the best potatoes, cream and cheese you can find and combine them in the right ratios. In general, you'll use 1 to 1 1/2 cups of cream per pound of potatoes when making a potato gratin. How much cream you use is partly a matter of personal preference. If you prefer a very creamy rendition, use a bit more cream. If you like drier potatoes, or you're trying to make a healthier dish, reduce the cream or substitute whole milk for one-fourth of the cream. Potato gratin isn't meant to be a diet food, though. This is one time when it's worth splurging on real cream -- in generous amounts. Cut portion sizes to assuage any guilt you feel. You've got a few options when it comes to making potato gratin. Some recipes call for combining cold cream and potatoes in a bowl with any seasonings and then baking the concoction in the oven. You can also combine the cream and the potatoes on the stove top and cook them just until tender before popping the dish in the oven. Whichever method you choose, be sure to slice the potatoes very thinly. This ensures that they'll cook quickly and also allows them to absorb more of the cream and cheese. If you're out of cream, you can use half-and-half or evaporated milk in a pinch, but cream really is the best option. Not only does cream thicken when it combines with the cheese, adding flavor and texture to the dish, but it's also less likely to curdle than other dairy products if it boils. If you choose to substitute another dairy product, use the same amount -- 1 1/2 cups for each pound of potatoes. Cream isn't the only ingredient that makes potatoes gratin special. Choose fresh, firm russet potatoes with no soft or green spots. Consider your choice of cheese carefully too. 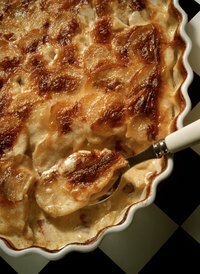 Recipes for potato gratin often call for Gruyere or Emmenthal cheese. These cheeses are absolutely delicious, but they're pricey and sometimes difficult to find. Substitute a good Swiss cheese or even a sharp cheddar, but buy the best cheese you can afford. The type of cheese you use doesn't change the amount of cream you'll need. To add more flavor to an already tasty potato gratin, saute sliced onions and fennel in butter until they're tender and add them to the dish before you bake it.